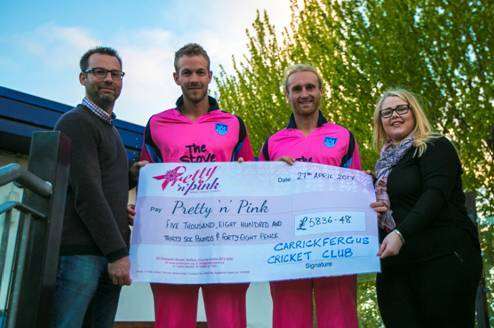 Carrickfergus Cricket Club is delighted to announce the final total raised for Pretty ‘n’ Pink is £5,836.48. Before the start of the 2016 Season the Club announced that it would link up with Pretty ‘n’ Pink, Northern Ireland’s only registered Breast Cancer Charity, to help raise funds. As well as number of fundraising events, the Club’s 1st XI donned the pink playing kit for their Cup matches throughout the 2016 season, adding a splash of colour to their Middle Road ground. Pictured right are Alastair Burton (from Club sponsors MG2), Patrick Botha (Club Captain), Jamie Holmes and Jamie Wallace (Pretty ‘n’ Pink).